An ontology is not a terminology, and a terminology is not an ontology: they have not the same goal. Nevertheless, ontology is today one of the most promising perspectives to Terminology (e.g. for IT applications) . Ontoterminology, terminology whose conceptual system is a formal ontology, is a new paradigm  introduced in 2007 . Based on the fact that linguistic and conceptual dimensions do not match, Ontoterminology makes explicit the double dimension of Terminology. Ontoterminology preserves the linguistic diversity taking into account multilingualism and allows to standardize the domain knowledge. Ontoterminology relies on a double semantic triangle. Term and Concept name are no more confused, as well as Term definition and Concept definition. Building ontoterminologies is a difficult task which requires a dedicated software environment. 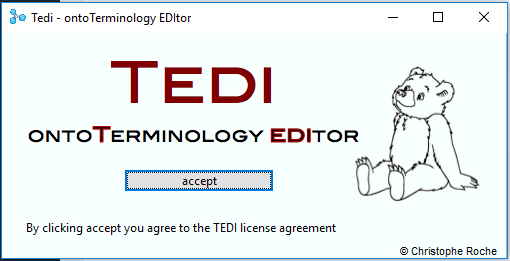 Tedi, for ontoTerminology EDItor, provides a set of useful tools based on epistemological principles. Tedi allows to define the formal ontology and the set of terms in the different languages idependently of each other. The different set of terms are linked through the shared ontology. It also allows objects and proper names editing as well as export in different exchange formats (RDF, HTML, SKOS, JSON).